Give your room a modern update with this intentionally snug cradlechair. Ultra-contemporary styling make this a statement piece thatcan be used in your home or office setting. 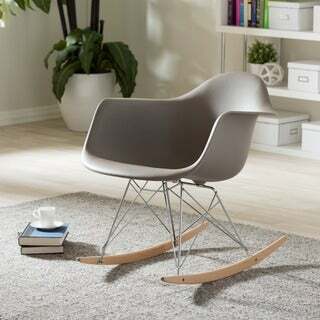 The molded one-pieceseat, crisscrossed chrome legs and majorly mod ash rockers makethis piece stunning, sturdy and sleek. This elegant addition to your modern or contemporary spacefeatures a form fitting seat designed to provided extra comfort forits users. Selected materials met requirements for safety anddurability as well as style. Available in white, this seatinstantly adds chic flair to the space it inhabits.